Delalande is portrayed wearing the insignia of the order of Saint-Michel, with which he was conferred in 1722, but his features appear much as they were two decades earlier. Delalande was arguably the greatest composer of French grands motets, a type of sacred work that was more pleasing to Louis XIV because of its pomp and grandeur, written for soloists, choir and comparatively large orchestra. According to tradition, Louis XIV organized a contest between composers, giving them the same sacred text and time to compose the musical setting. He alone was the judge. Delalande was one of four winners assigned to compose sacred music for each quarter of the year (the other composers being Coupillet, Collasse and Minoret). Delalande's was the most important quarter of the year because of the Christmas holiday. Later he had full responsibility for the church music for the complete year. At his death, since he left no mass of his own, the 1656 requiem of the Dukes of Lorraine by Charles d'Helfer was sung. Also, at least four collections of his works exist, each displaying different looks at composer's work as viewed by the people who assembled each collection. Scholarship of Delalande's work was for many years hindered because of inconsistencies in the spelling of his last name: de Lalande, Lalande, la Lande, de la Lande, and others. The family wrote the name as 'Delalande'. 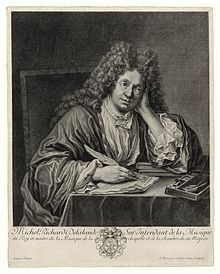 Finally, in 2006 the definitive "Thematic Catalogue of the Works of Michel-Richard de Lalande (1657-1726)" by noted British musicologist Lionel Sawkins came out which runs to 752 pages containing over 3,000 music examples and details of performing requirements and of all source materials, as well as with comprehensive indexes and thematic locators. grands motets - Latin settings of psalms including Lalande's Te Deum (1684). petits motets - shorter Latin settings for a few vocal and instrumental soloists and continuo, including élévations on an eucharistic text sung at the elevation of the communion wafers. Instrumental Lalande was an expert organist and harpsichordist, and yet has left not a single note of keyboard music. ritournelles - twelve substantial ritournelles for François Fossard and André Danican Philidor's book of Airs italiens (1695). For example, Lalande supplies a 31-bar-long ritournelle for two violins and continuo composed before ‘Giurai di non amar’ an aria from Domenico Freschi's Olimpia vendicata of 1681. Les Folies de Cardenio. Christophe Coin (Laborie) - court ballet, "The Insanities of Cardenio", after Cervantes. ^ Catherine Massip Michel-Richard Delalande, ou, Le Lully latin 2005 "Que savons-nous de Delalande claveciniste? Comme certains de ses confrères dont les plus illustres, les Couperin, Delalande pratique de façon experte les deux instruments à clavier. En l'absence de toute pièce de clavecin signée de son, nous en sommes réduits aux conjectures sur la nature et les qualités de celles-ci." Wikimedia Commons has media related to Michel-Richard Delalande.